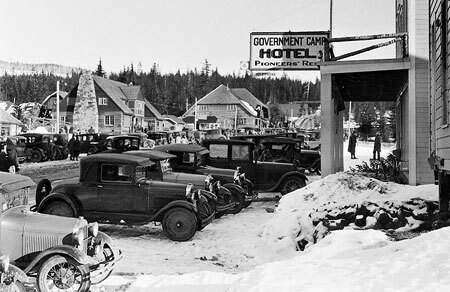 Since the early days of developed snow sports on Mount Hood in the 1920s, winter weekend traffic jams have been the norm. The cars have changed (and so has the highway, regrettably), but the same bottlenecks appear in pretty much the same spots, as thousands of Portlanders pour into the ski resorts over a few short winter weekends each year. 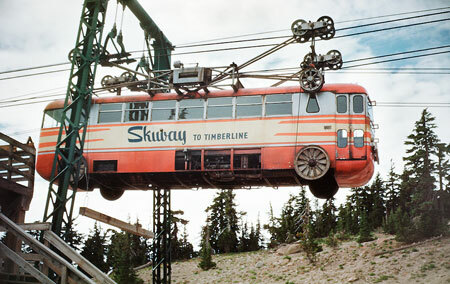 From the beginning, there have been overflow parking lots, ski buses, shuttles — even an aerial tram in the early 1950s known as the Skiway — all in an attempt to stem the weekend ski traffic. 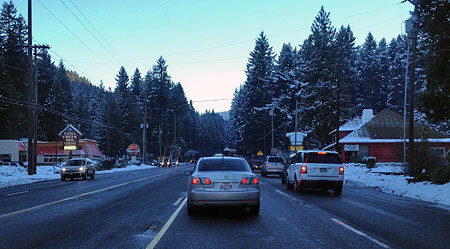 In 2013, the Oregon Department of Transportation (ODOT), in partnership with the U.S. Forest Service, the Federal Highway Administration and Clackamas and Hood River county officials, kicked off yet another effort to address the winter traffic overload. While this is just the latest of several ODOT-led efforts over the years to better manage the Loop Highway, the draft Mount Hood Multimodal Transportation Plan (MHMTP) is the best effort yet. While still only a document full of recommendations, the new plan offers real promise that federal, state and local officials are now more serious about managing the relatively short season of ski traffic gridlock. Instead of attempting to rebuild the entire highway corridor to meet the peak demands of ski resort traffic that occurs over a few weekends each year, the MHMTP focuses instead on low-cost, high-impact tools. This is a radical and positive change in mindset — even if the plan itself still has a few gaps. 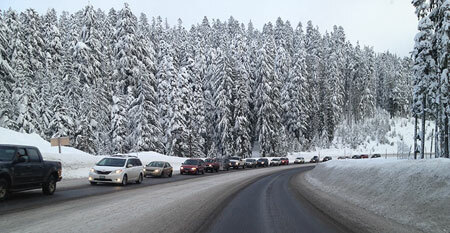 The stakes are high when it comes to managing traffic on Mount Hood. The ski resorts have little incentive to do anything except ask the general public to cough up more tax dollars for ever-wider highways. After all, it’s a sweet deal for the resorts and skiers, alike: in Oregon, just one in 25 residents ski, so the subsidy for highway projects catering to ski traffic is enormous. ODOT is currently seeking bids in the latest round of road widening, this time along the slopes of Laurel Hill in what will eventually total more than $60 million in state gas tax funding over the past decade to widen the Loop Highway from Brightwood to Government Camp. The traditional “building your way out” mindset has been bad for business in the local communities along the highway. The wider, noisier road has made it even less attractive for day tourists to risk a stop at the remaining shops and restaurants in the corridor. Worse, the huge 5-lane cross sections built on Highway 26 over the last decade have effectively cut the mountain villages in half by creating a scary barrier for local traffic to navigate, whether on foot, bicycle or in a vehicle. Widening the Loop Highway is even worse for the natural environment, as highway trash, polluted runoff and blown gravel enters directly into the Salmon River, Still Creek, Camp Creek (pictured above) and the Zigzag River. 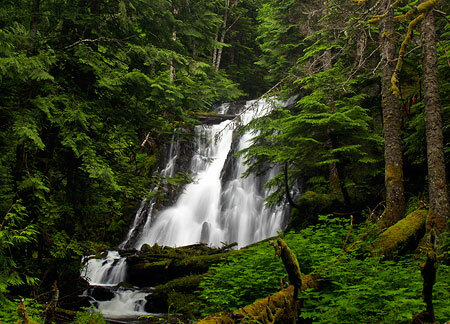 All four streams serve as important salmon and steelhead habitat, a fact lost on the rush to make room for a few weekends of ski traffic each year. 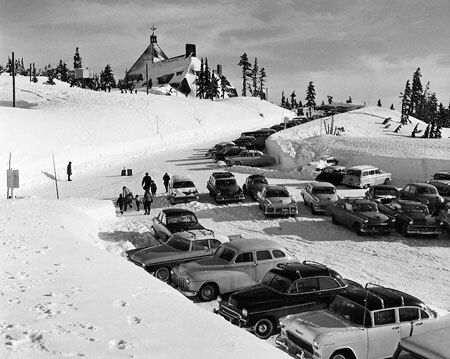 The Mount Hood Skiway was an early 1950s experiment to lessen parking pressure on Timberline Lodge – it failed, but may have been ahead of its time! The new focus on cost-effectiveness and a broader definition of desired outcomes beyond simply chasing traffic is new for ODOT — and for Mount Hood. It follows the lead of urban areas across the country, where cities are increasingly moving away from big-ticket road projects that seldom provide the advertised safety or mobility benefits used to justify them, and toward more practical solutions that have fewer unintended consequences. 1. Better managing the system: in this area, the plan calls for another plan known as a “concept of operations”, which is transportation jargon for an operations blueprint for the Mount Hood loop from the City of Sandy to Hood River. Elements of an operations blueprint could range from web-based traveler information to new or upgraded electronic message signs along the highway, with real-time updates on traffic, parking, transit and emergencies. The goal of this element of the MHMTP is to make the best use of the system through better-informed travelers and to better coordinate the various public agencies (ODOT, the Forest Service and the two counties) involved in operating the road system. How it could be better: the details of the “concept for operations” aren’t nailed down at this point (thus the need for another plan), but one strategy not mentioned in the list of possibilities is variable speed limits along the entire loop. This key recommendation from ODOT’s 2010 Highway 26 Safety Audit deserves to be a priority above other, more costly highway projects already moving forward in the area. DOTs around the country are using this technology with excellent results in improving safety and traffic efficiency, and ODOT should join the movement. An even larger gap in the strategy is an unwillingness by ODOT and the Forest Service to require the ski resorts to adopt peak pricing as a means to help spread out demand. The resorts are loathe to do this, given their troubled future (as described in Part 1 of this article), but if all three major resorts adopt the same policy, they will at least retain their current competitive positions with one another, while Mount Hood’s communities and environment would benefit from a coordinated effort to spread out the highway demand. Sadly, it will be a very long time before the Forest Service asks the resort to adopt more aggressive peak pricing for lift tickets, but that is the best long-term solution available for spreading out ski demand. Short of that, ODOT holds the cards for managing parking, as all parking along the mountain portion of the Mount Hood Loop Highway falls within a state-designated SnoPark permit area. 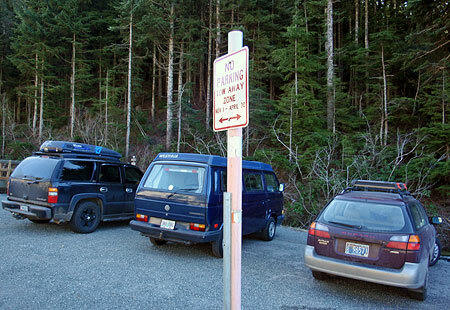 Currently, ODOT charges a generic fee for annual and day passes to park at the SnoPark lots (including all three ski resorts), but the agency should consider using these permits to better manage demand on the highway. This is a very low-cost strategy to avoid some very high-cost road widening projects. 2. Bicycle and pedestrian projects: this much-needed element of the plan calls for improved bike and pedestrian crossings at key locations along the loop highway. Highway widening is also called for to allow for more shoulder space for bicycles, along with bike safety improvements at key intersections and traveler information for bicycles. While not driven by ski resorts, this element of the plan embraces the potential for Mount Hood to become a more balanced, year-round recreation destination, and the Loop Highway becoming less of a barrier to hikers and cyclists. Notably, the famously crowded Mirror Lake trailhead is called out for relocation to address safety issues with the current trailhead. The new trailhead could be sited across the highway, accessed from an existing section of the Historic Mount Hood Loop Highway (that now serves the Glacier View SnoPark), and connected to the current trailhead with a new pedestrian bridge over US 26. How it could be better: “widening” for bicycle lanes is a default recommendation that you might expect from ODOT, but the lanes along the Mount Hood loop are already very wide in many spots, so keep your fingers crossed that our highway planners are judicious about where to actually widen the road. 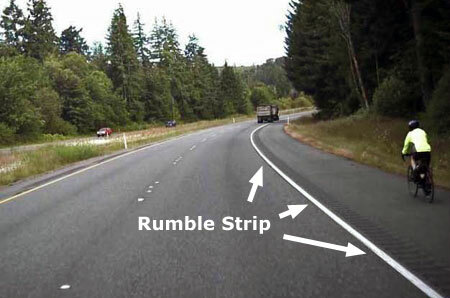 In most cases, simply providing rumble strips along the shoulder stripe would go a long way to keep cycles safe from motor vehicle traffic, and require fewer subalpine trees to be cut for road widening. A major gap in this element of the MHMTP is lack of policy direction on speeding or travel speeds — two of the three main contributors to serious accidents identified in the 2010 ODOT safety study (with winter conditions as the third). Extending and enforcing the existing ODOT safety corridor and 45 mph speed limit from Rhododendron to the Hood River Meadows entrance to Mount Hood Meadows would make cycling along this most mountainous portion of the loop highway much safer – which in turn, makes cycling more attractive, especially on the lower sections of the loop that are generally snow free year-round. 3. Improved transit service: The MHMTP plan calls for new transit from Sandy to the mountain, and Clackamas County recently received a US Department of Transportation grant to expand its Mount Hood Express bus service from Sandy to Ski Bowl, Government Camp and Timberline Lodge. Rides are $2 each direction, with ten buses daily during the ski season, seven in the off-season. 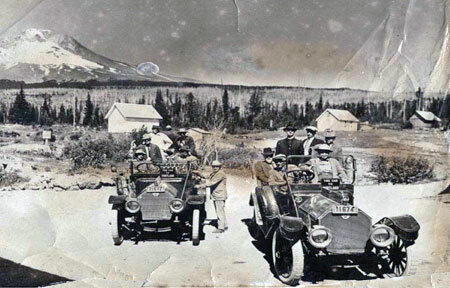 The trip from Sandy to Government Camp takes about 55 minutes and Timberline Lodge at about 75 minutes, so quite competitive with driving times and much less expensive. It’s a good start, and long overdue. 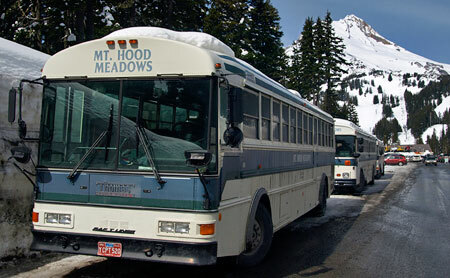 The fact that almost all traffic heading to the mountain during the winter season is destined for Government Camp, Timberline or Meadows makes the Mount Hood area highly serviceable with transit, provided a long-term funding mechanism can be found. How it could be better: The proposed transit service in the MHMTP is great if you’re coming from Sandy — or able to drive and park your car there — but it doesn’t allow for truly car-free trips to the mountain in a region that is increasingly interested in having this option. For years, people have wondered aloud about “extending MAX to the mountain”, but that will never happen — the cost would be astronomical and the ridership on the best of days wouldn’t come close to justifying the cost. But bus transit is completely within reach, and well-suited to the demand. A proposal called “The Boot Loop” on this blog showed how it could be done — save for public and private interests along the loop highway coming together to make it happen. Let’s hope the Mountain Express pilot project is just the beginning of a more comprehensive transit system on Mount Hood and in the Gorge. 4. 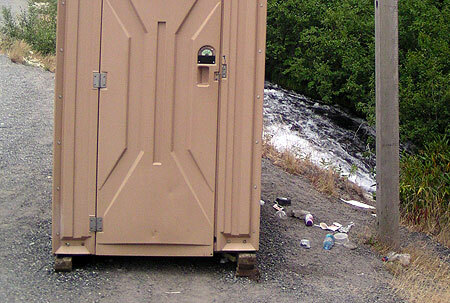 Safety projects: several critiques of ODOT’s ill-conceived “widening for safety” campaign along the Mount Hood loop have appeared in this blog over the past few years, and thankfully, some of the worst elements of the most recent phase between Rhododendron and Government Camp have been dropped. Most recently, ODOT failed to receive construction bids within its project budget for this latest phase, and that is potentially good news if it means that some of the remaining bloated, environmentally destructive elements of the project (like cutting back cliffs on Laurel Hill) are scaled back. Given this context, the safety projects contained in the MHMTP plan are refreshingly sensible and practice — truly “safety” projects, and not just an old-school highway widening agenda wrapped in an attractuve safety package. How it could be better: travel speed is the single most important lever for highway engineers to reach for if improved safety is truly the desired outcome. 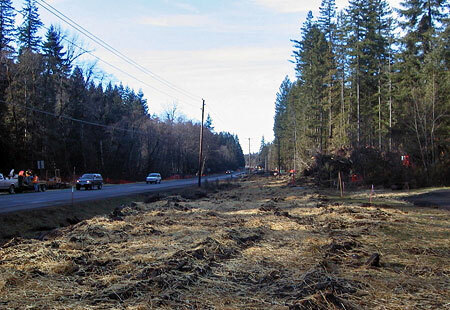 ODOT was bold and forward-thinking when it adopted a safety corridor along a portion of Highway 26 several years ago, and especially when the agency adopted a 45 mph speed limit from Wildwood to Rhododendron. 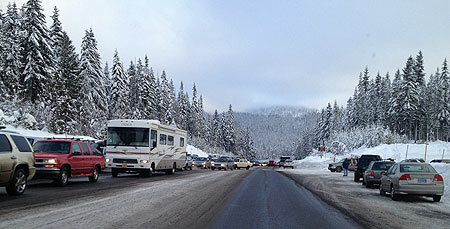 There’s no reason why this successful strategy can’t be extended for the remainder of the ski commute along the Loop Highway, to the lower entrance at Mount Hood Meadows. As the 2010 ODOT safety audit clearly showed, nearly ALL of the serious accidents in this corridor were directly tied to heavy winter travel, and especially weekends, when the predictable crush of day skiers descends upon the mountain. 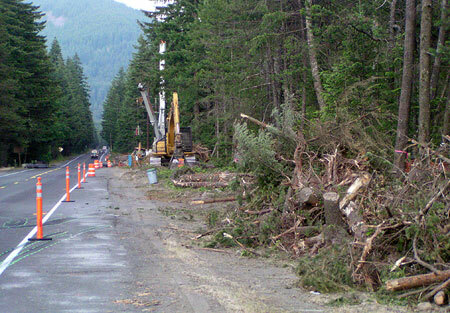 As the MHMTP moves forward toward funding, the focus will shift to Clackamas and Hood River counties, the Forest Service, ODOT and the ski resorts working collaboratively to bring the various strategies completion. The plan sets forth three tiers of project, but all recommendations fall within a (relatively) short window of 15 years. ODOT has an institutional habit of saying it “owns” the highways, but in fact, the public owns it – that’s us! Thus, it falls upon the true owners of the Loop Highway to track the details — the specific projects that will carry out the new direction called for in the MHMTP. Perhaps more importantly, it falls upon us to speak out against more funding of old-school road widening projects cloaked as “safety improvements” that could effectively cancel out the MHMTP proposals. Over the next few years, the recommendations in the MHMTP will gradually be funded through ODOT’s statewide transportation improvement program and similar capital funding programs at the local level. Watch this blog for more details on how the dollars actually roll out in coming years on our beloved loop highway!